(Newser) – Alberta has fought hard for more than 50 years to keep itself one of the few rat-free zones in the populated world, but that status could now be in danger. A rat colony has been found in a landfill near the town of Medicine Hat and authorities fear there could be more rats out there, reports the CBC. Exterminators have recovered 40 dead rats and have promised "swift and aggressive" action to stop the rodents from spreading. And the town isn't fooling around: Baited traps have been set in a 3-mile radius of the infestation, motion detectors will be installed, and bull snakes will be released in the landfill, reports the Medicine Hat News. Global warming? 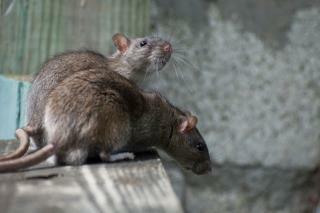 Norway rats. Wharf rats. Those are the big fellers, can reach 2 lbs.